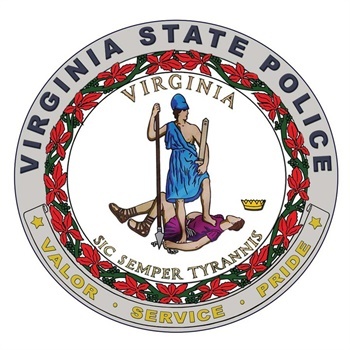 A Virginia State Trooper was seriously injured Thursday morning during a police pursuit in Chesterfield. The incident began when a speeding driver refused to stop for police on Powhite Parkway at about 2:23 a.m.
"A trooper conducting stationary radar on Route 76 southbound near Courthouse Road registered a 2005 Chevrolet Express 3500 van traveling 72 mph in a posted 60 mph zone and attempted to stop the vehicle for speeding. The driver of the van – Marc R. Toliver, 43, of Richmond, Va. – refused to stop for the trooper, whose lights and sirens were activated. A pursuit was initiated at that time," Virginia State Police spokesman Sgt. Steve Vick told WTVR. "The van continued onto Route 288 southbound, where it struck a state trooper’s vehicle involved in the pursuit. It then proceeded onto Interstate 95 northbound, where Trooper J.A. Short deployed a tire deflation device, bringing the pursuit to an end near the Chippenham Parkway Exit 67." Toliver swerved into the lane where Trooper Short was standing, Vick said. "In an attempt to avoid being hit by the vehicle bearing down on him, Trooper Short backed up and jumped over the barrier wall. He suffered serious injuries and was admitted to VCU Medical Center, where he is still being treated," Vick said.